Captain Erik provides all the necessary fishing and safety equipment for the best striper fishing adventure at Smith Mountain Lake to be had. However, come prepared Please be sure to ask Captain Erik what you should bring with regards to adequate clothing for the seasons, etc. if you’re not sure. Bring your camera and be ready for the thrilling fight that some of these stripers can give. We’ll let you do as little or as much as you’d like. You can learn from a pro and see firsthand how to present your bait and lure and the importance of finding the perfect location or you can sit back and wait for the moving sound of the drag when your fish is on and any and everything in between. Rockfish Adventures is equipped with a full t-top enclosure for inclement weather and propane heaters for winter months. Be sure to check out our extensive photo gallery (although it’s not all inclusive of every catch we’ve made). After your adventure, please be sure to send us photos of your catch and let us know if you’d like us to include it to our collection. At the conclusion of your chartered adventure, Captain Erik will clean, filet and bag any fish that are eligible for your keeping. 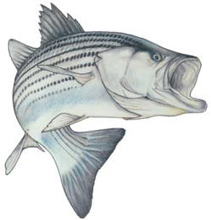 Please keep in mind that slot limits may be in place at different times of the year with regard to minimum and maximum length restrictions of stripers caught and are imposed. Rockfish Adventures has no control over these regulations but provides the same striper fishing adventure on a catch and release basis. Book your chartered adventure today and experience what so many others have with Rockfish Adventures, Smith Mountain Lake’s finest and most accomplished Striper Guide Service. Hire a guide to see firsthand how to present your bait and lure and the importance of finding the perfect location. For the Winter Months: Be sure you have plenty of warmclothes. You can NEVER have enough!